The incident reported below is a well-witnessed event, a case involving at least 12-15 witnesses, five of which were MUFON Field Investigators. Part of the event, which lasted approximately 5-10 minutes., (a 1.5 minute segment) was videotaped. 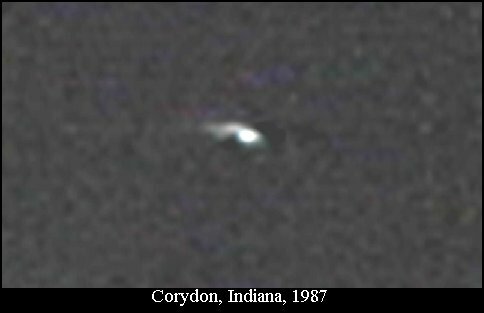 As a result of recent, intense UFO activity in the Corydon area, we had conducted a field test of our Rapid Deployment Group and ventured to Corydon, Indiana, and talked with approximately 50 witnesses. The initial investigation/meeting at 8:00 PM our time (9:00 PM their time) lasted about an hour. We then proceeded to an area where these NL's were being observed. We observed a jet aircraft coming from the west and I requested that a camcorder be used to gauge resolution and serve as a "control sample". Scott Wilkerson (FIT) conducted the "filming". There were four lights on the jet. At approximately 10:20 PM, an object described as brilliant orange, suddenly materialized in the SSE. The suddenness and the brilliant orange, flare-like characteristics were unmistakably unusual. The elevation of the object was approximately 20-25 degrees at the beginning of the sighting. The object appeared to be an orange headlight and appeared to be either hovering or moving toward the witnesses. At one point there was a rapid descent down to the left, all the time the brilliance varied only slightly. Several times the light winked completely out, only to flare up again. After about 5-8 minutes, the object went into a flat W-E flight mode at a relatively slow rate of speed at an elevation of 10-15 degrees. One member, Harold Hartig, a former radar operator (and GOC spotter) for the USAF and FI for MUFON, reported that through 10x50 binoculars, he observed a red light, about 1/200th in intensity compared to the orange light, in-trail. Later, he reported that at one time the object appeared as two orange balls, undeniable, with a very small sharply focused red light slightly above the gap. Another observer also reported the red light in trail. Jerry Sievers, Assistant State Director, verified the fact that the configuration in the beginning was defined as a small red light trailing the larger orange mass. The only person to see the red light were the ones using binoculars. At no time did the red light vary its set distance from the parent object. It was "apparently" part of the same object. However, during the 1.5 minute segment where the object was videotaped, the red light was in the lead as the object headed East. During this "filming" period the object "winked out" twice. The duration of the "winkout" was approximately the same, leading us to believe that the object passed behind two telephone or power poles. One such transit was verified. During the last 30-seconds or so a small commercial or private aircraft (not a jumbo jet) entered the immediate area from East to West on an "apparent" collision course with the anomalistic target. Several seconds of videotape document this as it "appears" as a near miss. Not knowing for sure that the objects were the same distance from us was the only consoling factor. The vertical separation was almost zero. The aircraft "appeared" slightly lower and closer to us when viewed on videotape. Due to curvature of the Earth, however, this may be misleading. The aircraft was traveling at least twice as fast as the unknown if at the same approximate distance. The ceiling according to Flight Service earlier in the Day was 4,000 broken. There were some clouds remaining at that time in the South and East. If the aircraft was traveling at 120 knots, the other target must have been under stall speed. Another orange target was observed by some observers and an attempt to lock-on with the camcorder unit was made without success, due to preoccupation with the primary target. Later on in the "evening", at approximately 12:15 AM, another orange target was observed at Elberfeld (near Evansville) by four person from the group. This was reported to be at low altitude (150' ) and was lost as the car carrying the observers rounded turns blocked by numerous trees. An official at Evansville-Regional Airport Control Tower was contacted on 24 August 1987. He was unable to shed any light on the object's cause or source. To his knowledge there is no known navigation light such as the orange lights being observed. However, an orange light could be produced by headlights at a distance as a result of air pollution, provided the object/headlights are approaching the witnesses. The absence of a green forward position light is suspect and the red position light should have been on the craft's "left wing". When the object was heading East, the steady red light was in the lead, which is not consistent with FAA regulations. There was an absence of a steady rear white position light. There is a possibility that the red light was not attached, but it "appears" to fly in a fixed position. That position changed several times, however, indicating some rotation. I personally observed this object from the very beginning. Its color, intensity and movements made it very suspect as a "normal source". Immediately eliminating any "natural source" I also find it difficult to place in a "manmade source" category, unless proper FAA lighting was not adhered to. This activity was observed near an airport and a moderately-sized city (Louisville, KY) where position lights and a see-and-be-seen situation is more of a life & death situation than other areas. There were no flashing red or white beacons or anti-collision lights at all, no belly strobes, and no steady white rear position light. There was no red light in a left wing position. If the "aircraft" were heading toward us and gliding to our left at the same time, the red should have been on the right or west side of the object. If going away from us, the red to the left would have been OK, except that the headlight (if that's what the orange light was} would have been pointing away from us. This was not a refueling operation. Not only do these not take place in areas close to airports, they are conducted at high-altitude, and the lights used are brilliant white. This was probably not any kind of helicopter for the same reasons mentioned previously. Mandatory position and anti -collision lights were absent. Position lights should be easy to see and the red one was very dim in comparison. If the object was further than we thought (the red light being so small that it could be seen only with binoculars), then the bright orange light was not only a dangerous distraction but much larger than it appeared. The actual "apparent diameter" of the orange verses the red appears to be about 6-to-1 on the observed video segment. However, the ratio could be much higher. The volume or intensity was about 200-to-l. The image on the videotape appears to be flatter than just. a ball of light. Because of the resolution of the camera it also does not show any color, but merely looks whitish. The red light appears duller, but the red does not appear. This resolution problem is not unusual for such a small target. 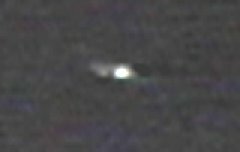 MUFON Form 8, Photographic Evidence, was completed and submitted by the camcorder operator and State-Section Director/FIT Scott Wilkerson. Preliminary data provided indicates the object was "filmed" at 6x magnification on the zoom mode. We believe that the normal mode would have not resolved the red object. It is our opinion that the object is unidentified. NATURAL SOURCES have been completely ruled out. Of the MANMADE SOURCES, Balloons, Fixed Structures, Hoax, Missiles, Satellites were immediately ruled out. 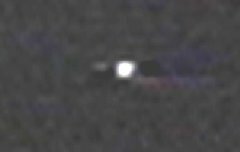 This leaves the remote possibility of aircraft, of course, but as witnesses (8 MUFON people, 5 qualified observers) and for reasons specified in the report, we are not convinced that this was any type of aircraft. Absent was the damning anomalistic motion or the over flight with total absence of sound. If the aircraft and the unidentified object were at approximately the same distance, the object would have been traveling at about half the speed of the aircraft, which may have been under stall speed. The long-awaited computer analysis recently conducted by our new scientist/member David Cook, was received on August 4th, 1990, and is now part of this report. The object is considered unidentified, borderline significance.